OGIS issues a final response letter to the parties when the dispute resolution process concludes. This letter documents the outcome of the process and any resolution the parties reach. No party may rely on the letter in subsequent proceedings and its contents are confidential unless both parties agree in writing to allow OGIS to disclose it publicly. Taking away the ability to rely on and publicize OGIS’ final response letters in future dealings with an agency, as precedent in possible future litigation, or even to inform the public on a blog – as OGIS itself has done – is a disservice to the FOIA community and to OGIS. 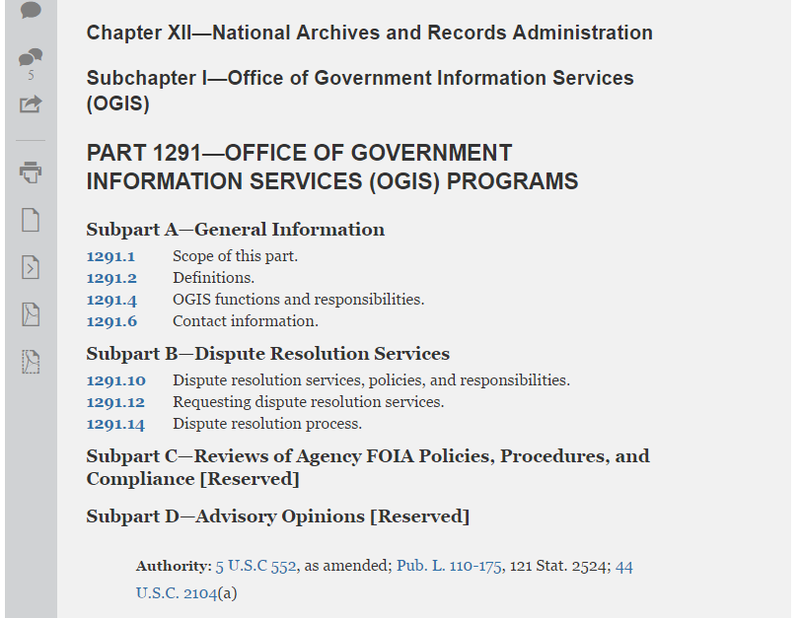 A review of some of the final response letters made available by OGIS provide an important and telling (if quantitatively limited) view into problems FOIA requesters and processors encounter, like problems with agency FOIA websites, the exceptional problem of FOIA referrals, and arbitrary appeal deadlines. Stating that no party may rely on these final response letters undercuts the premise that other agencies, agency lawyers, and judges should defer to the FOIA Ombuds office as the FOIA experts, and keeping the letters confidential would be an ironically un-transparent move for the ombuds office. The comment period ends on February 27. The FBI says it will lift current restrictions on the portal – like requirements to provide a phone number with a request – by March 1. The Daily Dot reports, “Attorneys who specialize in litigating FOIA cases expressed concerns on Tuesday over the amount of personal information the FBI intended to collect from users of its online portal: phone numbers, physical addresses, and whether the records were being requested from outside the country.” MuckRock contributors Michael Best and JPat Brown go further into detail on the “arbitrary restrictions on the law” here. The FBI isn’t alone in making it more difficult for the public to file FOIA request. The FCC, Customs and Border Protection, and possibly other agencies (let us know which!) are also no longer accepting FOIA via email. One of the most frustrating aspects of the FBI’s move is the House’s 2016 FOIA Oversight and Implementation Act (H.R. 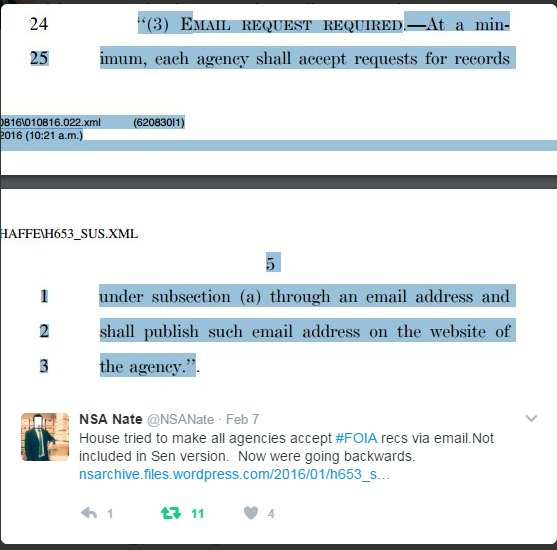 653), which unanimously passed the House, but was ultimately not adopted into law, required agencies “at a minimum” to accept FOIA requests via email. This commonsense provision embodied the spirit of the transparency law by allowing requesters to submit FOIA requests via their preferred platform – increasingly email – over mailing in physical requests, faxing them, or using oft-clunky FOIA portals. In short, the provision broadened access to FOIA, and the FBI’s move is a step away from increased access. Each agency’s FOIA regulations state how that agency will accept FOIA requests. As agencies update their FOIA regulations – as mandated by the FOIA Improvement Act of 2016 – they should not take it as an opportunity to make it harder for requesters to submit their FOIAs. It’s wrong, and it’s not what the Senators and Representatives who championed improved FOIA legislation intended when the passed the bipartisan, bicameral improvements to the statute last year. How Does Your Agency Perform A FOIA Search? The National Security Archive will soon be distributing an unofficial survey for both FOIA processors and FOIA requesters on how agencies conduct searches. The goal of the survey will be to collect data on disparate agency search methods and software. The FOIA Federal Advisory Committee has a subcommittee devoted to studying searches. 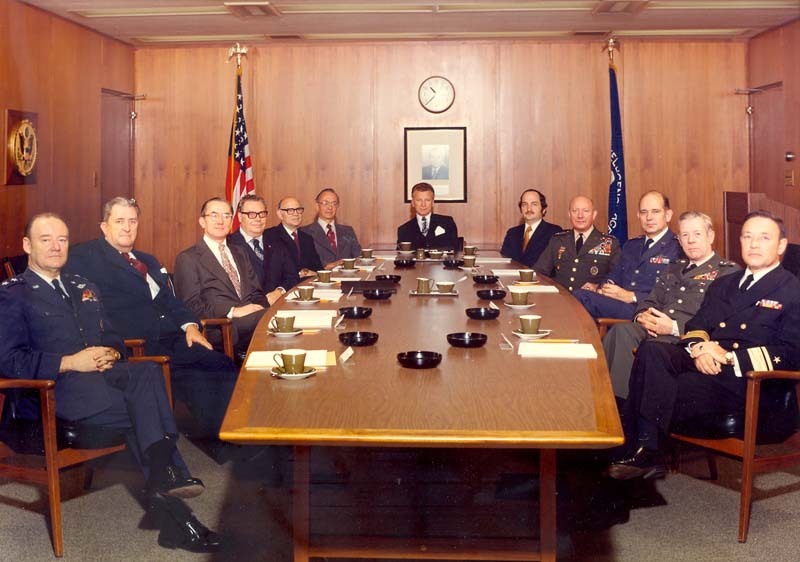 A declassified Strategic Air Command History from 1968, recently cited in former SAC commander-in-chief Lee Butler’s memoirs and highlighted in a posting by the National Security Archive’s Nuclear Vault director William Burr, sheds light on the role of anti-ballistic missile defenses in national policies and international relations. 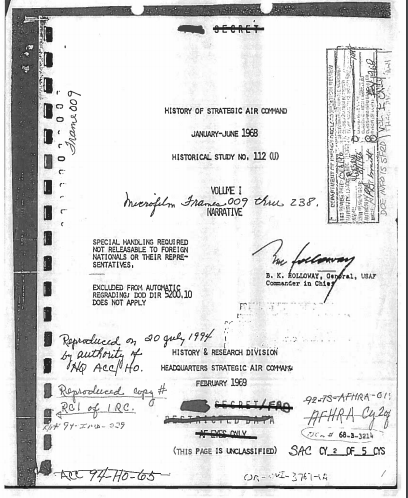 Burr writes that, “According to the SAC history, in the late 1960s, SAC targeted over 100 Minuteman missiles, over 10 percent of the ICBM forces, on Soviet ABM sites lest Soviets disrupt a U.S. nuclear strike in the event of the outbreak of general war.” For a deeper read of the fascinating document, go here. MuckRock has launched a survey for members of the public to alert the transparency organization if a government database has been removed from an agency website. The survey was launched after news broke that the Department of Agriculture abruptly took down its animal research database – containing “reports of inspections by USDA’s Animal and Plant Health Inspection Service.” MuckRock will use the survey to build a repository of “endangered data” and will file a FOIA request for the missing government data and try to make it public again. MyBitcoin Hack Not Thoroughly Investigated by FBI? New FBI documents released in response to a FOIA request filed by Jason Leopold regarding the bureau’s handling of the 2011 hacking of the popular e-wallet site MyBitcoin beg the question of whether or not the bureau understood the cybercurrency is real money. In 2011 MyBitcoin was hacked to the tune of $1 million in Bitcoins; the site urged users to report their losses and the company would reimburse “49 percent of their last-known stored value,” prompting some to speculate the hack was an inside-job. Others, however, urged MyBitcoin users to complain directly to the FBI. The documents obtained by Leopold, imply “that the FBI didn’t understand that the possible theft of Bitcoins from MyBitcoin was equivalent to a major robbery.” Leopold posits that the FBI’s view of “Bitcoins users as criminals” because Bitcoin can be “used to fund illicit activities” may have played a role in the inaction. A 2015 General Services Administration Inspector General report found that personally identifiable information (PII) was unprotected in the GSA’s Google Cloud. The IG noted that within the organization’s Cloud computing – an environment that contained nearly 4 million documents at the time – PII, including social security numbers, passport and driver’s license numbers, home addresses, and medical needs, were accessible to employees and contractors without a valid need to know the information. The report indicates a number of steps GSA should take to address the privacy concerns. This document is one of a dozen new additions posted in the National Security Archive’s Cyber Vault on Wednesday, February 8. This week’s #tbt pick is a 2013 posting spotlighting a previously secret State Department intelligence memorandum that predicted, five months in advance, the 1973 Arab-Israeli war. Published for the first time by the National Security Archive, the INR memo from May 1973 warned Acting Secretary of State Kenneth Rush that there was a “better than even bet” that war between Egypt and Israel would occur “by autumn.” According to the INR analysis, Egyptian President Anwar Sadat would initiate a war with Israel not for specific military objectives but to spur “big power” diplomatic intervention in the Arab-Israeli conflict so that Egypt could regain the Sinai Peninsula lost in the 1967 War. On 6 October 1973 war broke out in the region.